John O’Sullivan, Managing Director, Tourism Australia, at the Australian Tourism Exchange. Copyright : Tourism Australia and South Australia Tourism Commission. India has emerged as the fastest growing market for Australian tourism, beating China in terms of growth rate, though not in the absolute numbers. The surge has been fuelled by a growing economy and an upwardly mobile middle class with higher disposable income. “Australia Tourism’s 2020 goal of 300,000 arrivals, from India, has been achieved in 2017. In fact, India has seen 302,200 arrivals in 2017,” said Nishant Kashikar, Country Manager, India and Gulf, Tourism Australia, while addressing Indian media at the Australian Tourism Exchange (ATE), 2018. The ATE is Australia’s largest annual event for building tourism opportunities and relationships. 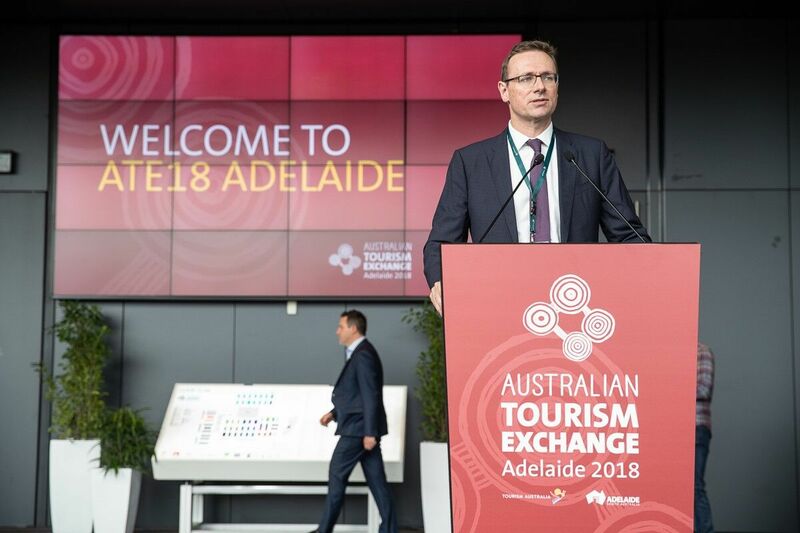 ATE 2018 ran from April 15 to 19 in Adelaide and was organised by Tourism Australia in partnership with the South Australian Tourism Commission. ATE 2018 saw around 1500 Australian seller delegates, from approximately 550 companies, 700 key buyer delegates from over 30 countries, and over 80 international and Australian media. John O’ Sullivan, Managing Director, Tourism Australia, described India as a ‘rising star market’, and attributed the growth to the Cricket World Cup, which was held in Australia in2015. O’Sullivan said, “We’ve got a strong cultural connection with India as we are both former British colonies, and cricket is our game. The Indian Cricket team was in Australia for almost six months and that was a real driver for tourism.” O’ Sullivan further stated that cricket may have sparked off a subtle shift in demographics – from the Indian tourist who was visiting family and friends, to the leisure visitor who was there for the game. When asked if a ‘cricket trail package’ that consisted of tours of various cricketing grounds, and museums dedicated to cricket and cricketers had been put together, O’Sullivan said that it had not yet been put together, but seemed a ‘great idea’. In 2017, India was Australia’s eight largest inbound market in terms of visitor arrivals; seventh largest market for visitor spend; and the market with the highest growth rate. In 2017, Indian visitors spent 15.7 million nights in Australia, an increase of 7 per cent over 2016. The average length of stay for the Indian visitor was 55 nights, with a 49 per cent repeat visitation. And the average spend by the Indian traveller was Rs. 2,53,200. While the cricketing trend is picking up, the findings of the customer research and Consumer Demand Project (CDP) have revealed that the top five Aussie attractions that appeal to the Indian traveller are the Australian beaches, iconic landmarks, wildlife, food and wine, and the Great Barrier Reef (GBR). One of the biggest hurdles faced by the Indian traveller is that of visas. To ease the process, the Australian Department of Immigration and Border Protection has extended online filing of visitor visa applications to all Indian nationals. This system offers 24/7 accessibility, electronic payment of visa fees, and ability to check status of application at the push of a button. O’Sullivan also added that Tourism Australia is making representations to relevant government departments, so as to reduce processing time for visa applications.